Light Music is an innovative work presented originally as a performance that experiments with celluloid and sound to push the formal, spatial and performative boundaries of cinema. An iconic work of expanded cinema, it creates a more central and participatory role for the viewer within a dynamic, immersive environment. Formed from two projections facing one another on opposite screens, Light Music is Rhodes’s response to what she perceived as the lack of attention paid to women composers in European music. She composed a ‘score’ comprised of drawings that form abstract patterns of black and white lines onscreen. The drawings are printed onto the optical edge of the filmstrip. As the bands of light and dark pass through the projector they are ‘read’ as audio, creating an intense soundtrack, forming a direct, indexical relationship between the sonic and the visual. What one hears is the aural equivalent to the flickering patterns on the screens. Light Music is projected into a hazy room – the beams that traverse one another in the space between the two projections become ethereal sculptural forms comprised of light, shadow and theatrical smoke. 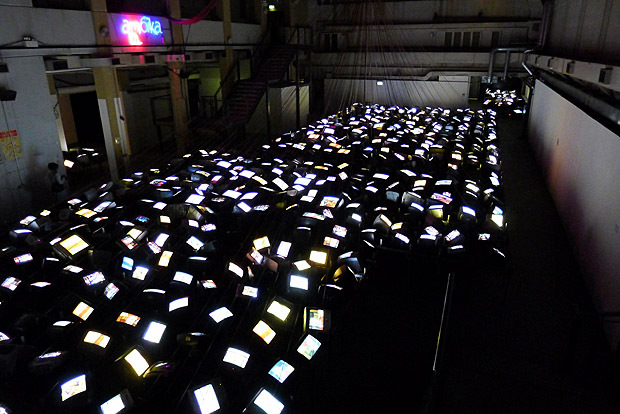 This format is designed to encourage viewers to move between the screens, directly engaging with the projection beams, forming a set of social relations in which cinema is transformed into a collective event without a single point of focus. Light Music occupies an important threshold in film history, drawing on early experiments in ‘visual music’ from the 1920s by pioneers including Oskar Fischinger, Hans Richter and Walther Ruttmann, and subsequently opening cinematic practice up to a host of concerns from gender politics to phenomenological experience. Lis Rhodes (born 1942, London) is a major figure in the history of artists’ filmmaking in Britain and was a leading member of the influential London Filmmakers’ Co-op. She currently lives and works in London, where a survey exhibition of her career, Lis Rhodes: Dissonance and Disturbance, was held at the ICA from January to March 2012. Her films are distributed by LUX. Conceived and made specifically for broadcast, these were transmitted by Scottish TV during the Edinburgh Festival. The idea of inserting them as interruptions to regular programmes was crucial and a major influence on their content. That they appeared unannounced, with no titles, was essential.. These transmissions were a surprise, a mystery. No explanations, no excuses. 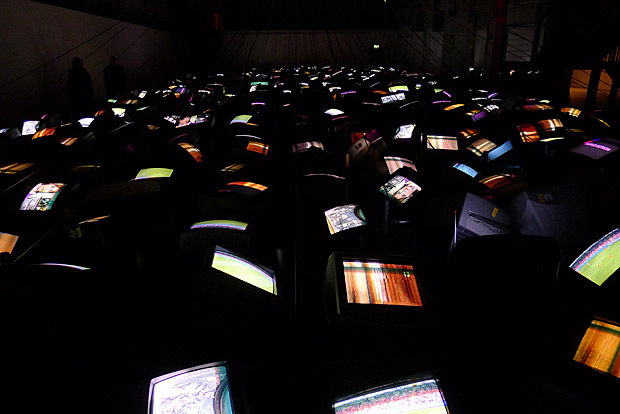 Entitled ‘1001 TV Sets (End Piece)’, 1972-2012,’ this work by video art pioneer David Hall at London’s Ambika P3 features over 1,000 TV sets, all tuned to random terrestrial stations. David Hall (b. 1937) was awarded first prize for sculpture at the Biennale de Paris in 1965 and took part in other key shows including Primary Structures, New York in 1966 which marked the beginning of Minimalist art. Soon he was using photography, film and video to make single screen and installation work and exhibiting internationally at many venues including Documenta Kassel, Tate Gallery London, Centre Georges Pompidou Paris, National Museum Reina Sofia Madrid and the Museum of Modern Art Vienna. His first television interventions appeared on Scottish TV in 1971 and his first video installation was shown in London in 1972. He participated in forming the Artist Placement Group with John Latham and others in 1966; was co-organiser of The Video Show (first major international show of artists’ video in the UK) at the Serpentine Gallery, London in 1975; and was co-curator of the first video installations exhibition at the Tate Gallery, London in 1976. In the same year he initiated and was a founder of the artists’ organisation London Video Arts (now part of Lux, London). Appointed Honorary Professor at Dundee University in 2003 he has taught at the Royal College of Art, St Martin’s School of Art, Chelsea College of Art, San Francisco Art Institute, Nova Scotia College of Art and many others. He introduced the term ‘time-based media’ through his writings, and created the first time-based art degree option with emphasis on video at Maidstone College of Art, Kent in 1972 (now University for the Creative Arts). He has made work for broadcast by, among others, BBC TV, Channel 4 TV, Scottish TV, Canal+ TV and MTV. 1. Sean Cubitt, Greyscale Video and the Shift to Colour, Art Journal, Fall 2006. 2. Michael O’Pray, Monthly Film Bulletin, British Film Institute, February 1988, and A Directory of British Film and Video Artists, ed. David Curtis, Arts Council of England 1996. 3. Nicky Hamlyn, Coil magazine 9/10, London 2000. 4. Chronology, Diverse Practices: A Critical Reader on British Video Art, ed. Julia Knight, Arts Council of England 1996. 5. A L Rees, Stephen Partridge catalogue, University of Dundee 1999. 6. Jeremy Welsh, Video Positive catalogue, Tate Gallery Liverpool, Moviola 1991. 7. Jean-François Lyotard, Brief Reflections on Popular Culture, Institute of Contemporary Arts Documents 4, London, 1986. Given the recent opening of an exhibition of Nam June Paik’s work at the National Gallery of Art, as well as the long-term commitment to media art the Smithsonian American Art Museum has made its Watch This! exhibition, I thought now would be a good time to talk with SAAM’s senior curator for media arts, John G. Hanhardt, about the Nam June Paik archives. SAAM acquired the archives in 2009 and plans to dedicate an exhibition to them next year. We discussed the institution’s commitment to Paik and the history of the moving image, the difficulties of presenting media art, and the upcoming show. Washington City Paper: Since a personal relationship often springs from a professional relationship, how well did you know Paik? John Hanhardt: I knew him very well from the early 1970s, and I was privileged to be engaged in his work and to include his work in numerous exhibitions. I traveled with him to Germany where he introduced me to many of his colleagues and friends. I would visit him and his wife, Shigeko [Kubota], in his loft and studio. We were in active personal communication and spent time together. After his stroke I visited him very shortly thereafter in the hospital, and flew down to Miami, frequently, to see him. I spent time with him regularly until the end. A lot of our conversations were about projects, because he was always working on things: whether it was developing a satellite television project, or a video tape, or a sculpture. Some of those projects were discussed because I was involved in them as a curator and some of those things we discussed were because he wanted me to know about them.